The Ink Trap: Giant Blog Hop at Art Impressions! Hey, all! 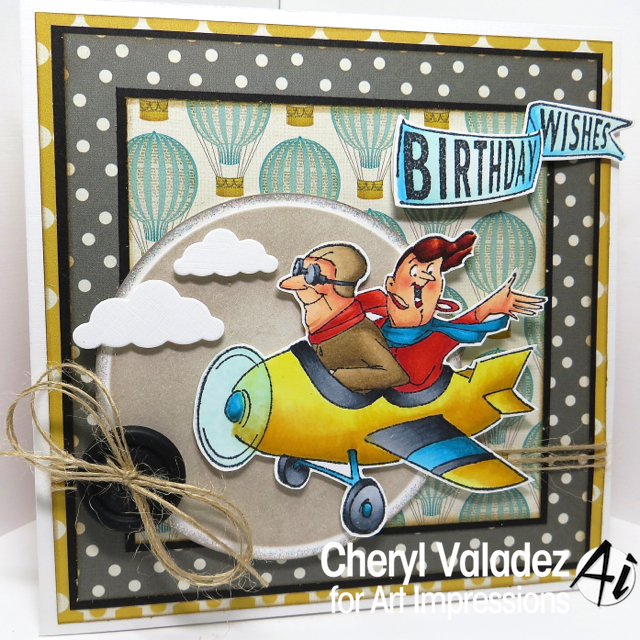 I'm back today with a very special Michael's Blog Hop post for Art Impressions. 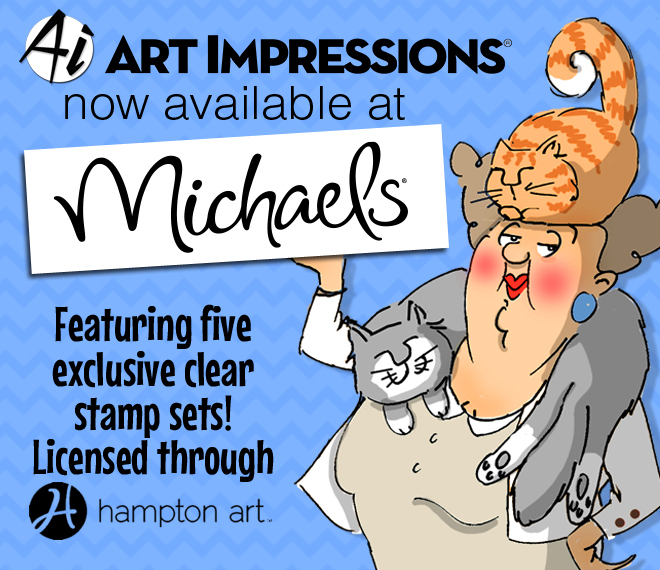 Michael's stores will now carry some very special clear sets created just for them! We have a stellar lineup of very talented artists showcasing these wonderful new sets, so be sure to visit each and every blog so you don't miss a single eye-catching detail. If you get lost along the way, head back to the Art Impressions Blog where you'll find the complete hop list. 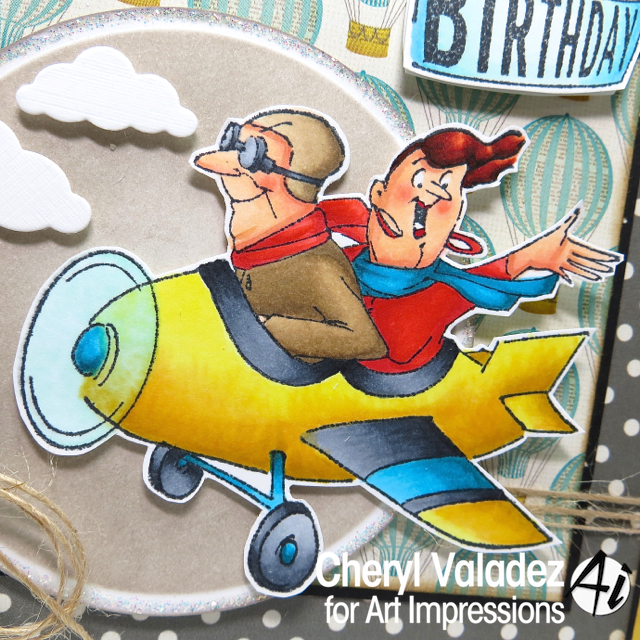 For my card, I've used SC0649 His & Hers Flying High. There are 9 stamps in this set including some pretty awesome sentiments! You should have arrived here from the exquisite blog of Angela Boutiller. Your next stop is the eye-popping blog of Sandy Allnock who will no doubt knock your socks off. Visit this link and learn all the details regarding Michael's and these new sets. Thanks so much for joining us today! Until next time, stay crafty! I adore the way you have built up the layers on this masterpiece! I was staring at this card for a long time. There is a LOT going on but not in a busy way....there are a lot of layers done really nicely. Seriously impressed! Ooops I also meant to say I really like the balloon DP too and I think that is the BEST fussy cut I have ever seen! That hot air balloon bg paper is so fitting, as well as the clouds. Love that birthday banner and your coloring of the image is perfect. Great job all the way around. fun card! love the scene you created on it. Love It! The coloring is perfect with a great background. TFS. wow, awesome card. awesome coloring. fantastic card like the way you colored it. Super card! your coloring is fantastic. I love the design, embellishments & papers. Very striking - love it! Cheryl, your card is amazing, gorgeous!!! Love the card and all the papers incorporated. BEAUTIFUL As always!!! Stunning coloring! Love this stamp set, it's the one I want the most of the new releases. Ok...you remember my birthday is in September, right? LOL!! I adore your work and I'm in love with this card!! Thanks for sharing your cute card! I had SO much fun playing with this set! Love your scene and fabulous coloring, Cheryl. Super fun card, love the design n how you popped up everything. Also love the bling around the circle, nice touch, TFS! That is a great card! I also like the background paper you used. Beautiful card and what a fantastic layout for that image. Thanks for sharing. What a FAB card! You are so amazing with layout and coloring, your creations are always stunning! Totally cute! Love all the AI stamps and can't wait to get these. Love this card Cheryl! Happy to be included with all you AI gals!